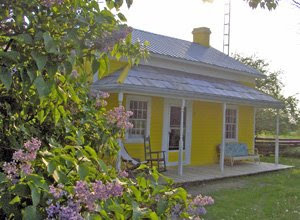 I want a little yellow house. I want wisteria, and rose bushes surrounding it, and a garden in the back. I will make perfect little curtains to adorn the perfect little windows. It will be easy to decorate with the most gorgeous furniture due to it's small size. It will have an inspiring kitchen with checkerboard tiles, and robins-egg blue Kitchen Aid supplies. A claw-foot bathtub would also be a necessity in this little yellow house. With all it's character, this house will bring me so much joy!